It was pestopaloosa at Lucindaville. 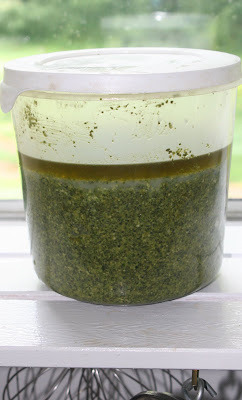 Even with our abysmal garden, we collected enough basil to produce about 20 cups of pesto. That should keep Doe Run and several of our close friends in pesto through the winter. That looks delicious and so lovely to have in the pantry. Do you follow a family recipe? Twenty cups? Obviously you don't know the definition of abysmal. I, on the other hand, do, and have the basil corpses to prove it. Usually I have twice as much. Lovely thigh-high basil in August. This year knee-high in July and it was starting to bolt.